Hello! Welcome to Handmade Monday! Handmade Monday is popular and I feel I've made some really good blog friends through it (I think some of you feel the same way too). We don't get hundreds of people linking, but we always get a good number, and there's always a good feeling of community, I think. It has developed a bit of a life of its own, I feel. So, I started the midweek papercraft party, thinking it might run along the same lines... and of course, hoping that it might help to promote my digital stamps, which is a new start up (many of you know how difficult new websites are to promote and get off the ground). 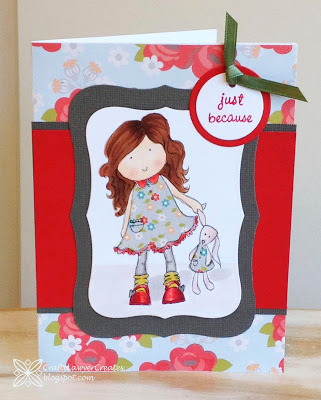 I expected that there would be less interest in the new linky party than in Handmade Monday, but I must admit I was disappointed that nobody has linked up this week. It feels like it's doomed! Am I doing something dreadfully wrong? A few stats: I have promoted the papercraft party in a few places. There are 30,000 page views each month on this blog. There are over 300 followers via Google and more via other blog readers. Many of those won't be papercrafters though, because I blog about other stuff too. Is it a numbers game, or is something else wrong? I think that perhaps two linky parties a week on one blog may be too much. So, do I combine the linky parties? Do I kick one in touch? Do I carry on regardless? Some of my thinking is along the lines that I may be trying to do too much on one blog. Am I? Or am I trying to run before I can walk? I have to think about the Handmade Monday crowd, I know that. I also have to think about my design team: these are a group of lovely ladies who make the most wonderful cards and other papercraft projects with my designs and blog about them - for no other reward than some free digi stamps each month. I think they deserve a blog post each week linking to their sites - a blog post which I had thought should really introduce a challenge to readers. But does it need to? Or perhaps: does it need to for now? I do think some hard thinking is in order for me this week - and I would very much appreciate feedback from anyone who has any insight, ideas, opinions or advice to offer! I think a few big thank yous are in order right now too! - Firstly, thank you to everyone who links up to Handmade Monday because you remind me how fabulous the crafting community is. - Secondly, thank you to the Handmade Harbour design team - you are all just amazing and I'm so grateful for your wonderful designs and enthusiasm. - And thirdly, thank you to anyone who can help me sort my muddled thinking out a little! Thanks also for reading my ramblings! The images are all courtesy of the design team this week! I would've joined in again last week, but I was away! I am just trotting off to do this weeks one though!! Just got to hope I have enough black ink left to print my images off from you! It must be disappointing but to me it feels as though you've only just started so rather soon to panic too much. 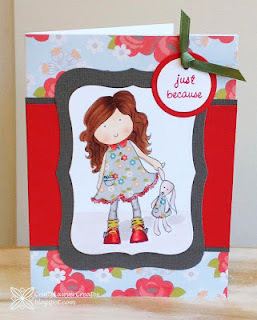 I do have to admit that as the midweek is all about papercraft I haven't paid too much attention though - it's not an area that grabs me - but I would have thought from the number of people who love card making that it was a great idea. I wouldn't think that the 'problem' is two linky parties but that the papercraft world just hasn't got involved yet. I think I'm rambling now! but thank you for hosting Handmade Monday - it's been my introduction to blogging and I enjoy the weekly catch-up with others who I feel I have got to know through here. First of all, gorgeous cards! Your design team really are a clever lot, as are you of course for creating such fabulous artwork for your digi-stamps! I think part of the reason that HM does so well is that it is open to all types of crafting and there are sooooo many crafts out there - people feel they can join in with anything they've created, from a tasty cake they've made for their family to the latest crochet item listed on their website for sale and nobody feels out of place. I think that because the papercraft part is focussing on one particular craft its bound to be harder to get off the ground and to keep the numbers up. On the other hand, once regular visitors have been established i'm sure that strong bonds will be established between them, i'm sure its just a matter of time and persistent networking to connect with the people its ideally suited to. Another point that occurs is that perhaps it would be interesting to think about why people write their blogs and how HM or the papercraft party is relevant to those things. For my part i would say that the 3 main reasons i write my blog are to get feedback on new lines (HM is super useful for that), to connect potential customers with my products (I have made quite a few sales through my blog, including to fellow HM bloggers - generally those who specialise in different crafts to myself). The third reason is that blogging is a great way of keeping a structured record of what i've done. The history of my business can be tracked by myself or others through my blog. I'd like to second Catkin Jane's comments. It may be a little too early to panic yet. Hang on in there a bit longer and see what happens. Good luck. I can only echo what others have said, it's only been a short time and I think that if you persevere things will start to come together soon. As you say, a lovely community has built up at HM and I'm sure that it will happen again with your new venture. No worries! EVERYTHING you're doing NOW is FINE! -- It's just a hectic time of year for Everyone! Actually, I'm rather GRATEFUL for your whole "linky" thing! My "stats" have TRIPLED since joining up! It also gives me that push to FINISH my own Projects in a shorter time. -- So THANK YOU!! I do intend to join in with your midweek party, but because I'm quite an anxious person, and I'm not sure what the blog post should look like, I've been waiting for a few weeks to be able to read other entrants blogs to see what its supposed to be. I also love looking at the fabulous cards the design team come up with. 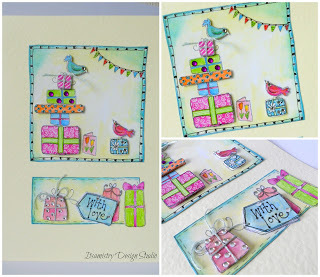 I would say its early days for the midweek party, maybe some of us card-y types can publicise the challenge on our blogs which might gain some more people. The midweek party is quite new so it will take some time to become popular. With it being more focused on a particular craft will limit the numbers a bit, whereas Handmade Monday is open to all crafts. Having 2 linky parties a week shouldn't be any problem. It sounds like a good number to me. Persevere with it a bit and see how it goes. If things still don't improve, it could be that mid-week can be a bit of a slow time..Perhaps consider moving the party to a Friday, if you don't get more people linking up, since it's the start of the weekend. I have whizzed down the page, as I want to leave my comment without reading what everyone else has said. Please don't give up on handmade monday. It really is a great linky, just because it is a good mix of crafts, and a mix of hobbyist and people running businesses. I link up other places, but often they are so big that no one really looks at each others sites. Handmade Monday has a real sense of community, and I do think of many of the other linkers as my friends. (Wouldn't it be great if we could all have a big party!) Perhaps you should give it a few more weeks and a bit more plugging. Did Handmade Monday take off straight away, or did it take a while. Lots of great feed back. I love HH Monday too, tho I don't link. I love to see the handmade things and especially the sneak peeks at Wendy's works for the magazines. Don't give up on the mid-week papercrafting event. It's the time of year when everyone is madly making for Christmas orders and craft events, getting children settled in for their first time at school or returning to school, plus getting ready for entering University. Could be that once we have all settled down and got into our autumn stride, more people will take part. It's a great idea and a chance to showcase work is always welcome. 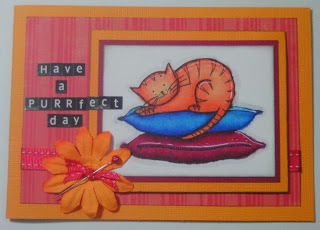 The cards you have shown us this week are lovely and your team are very talented and inspiring. Personally I would keep going with both linky parties, as they are for different audiences and achieve different things. Keep advertising the papercraft party and hopefully you will see it grow slowly. In the meantime, maybe your papercraft post could be about more than just the challenge (in the same way that the handmade monday post is about more than just the link up). Maybe write a post that papercrafters would be interested in, then introduce the challenge at the end. 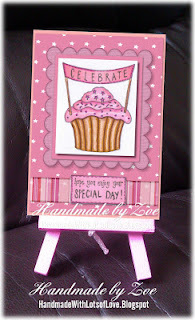 I make cards, but I hardly ever use normal stamps and I've never used digital stamps. So I think you need to work out who your customers are and where they hang out. 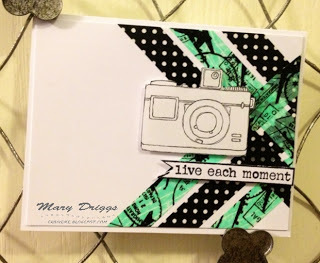 One more idea - could you invite everyone who buys a digital stamp to participate in the link up? Keep going. Things take a while to get established. I echo what everyone has said so far. Please don't be disheartened. It's still early days. I'm sure when you got HM off the ground it took a few weeks to get established (I didn't come in until late so don't know). I've made a lot of friends through HM and through their comments on my blog they brought comfort when my mam died and also kept me going with encouragement (or telling me to behave...) when I had my two hip operations. Hi Wendy I pretty much agree with everyone else it's early days and I think the blogging world has been quiet over the summer with the sun we've had. I'm not a paper crafter but I do follow Mrs A who has visited HM. Her blog is It's an Alien Life, I wondered if it would be worth getting in touch with her as she links to lots of card blogs. I know this may be time consuming but just a thought. Have a good week. I think you shouldn't worry too much at the moment because it's early days. I don't take as much in terest in the papercrafting blog posts on your site as it's not an area that I am interested in (though I'm always showing my Mum your digi stamps!). I think there probably is room within this one blog for 2 linky parties and with features from your design team - over time, people will know to check in with you on particular days because certain subject matters will be covered. If you're just starting with the second party link, it is normal it is a bit slow. I know it is a very bad feeling when nobody seems to be interested. But it may just be bad luck. I would say if this is not too much work for you, keep going with both and review in a few months. I've not been around the blogsphere for a little while so i actually wasnt aware of your new link party. I would echo what other people have said, dont panic yet, its early days. I would wait and see how it takes off. A big thank you to all of you who have taken time out to give your opinions and advice - this is one of the very best things about blogging!